I still didn’t follow such a principle. This mother felt she was too occupied with her five boys and household chores to rearrange things in the dresser. I was so confused that day I would want to divert my thoughts into something else. An invitation to attend the workshop surfaced, and so I went. The next thing I know, I am eager to choose and welcome joy into my life the KonMari way. Leading the participants determine if such item sparks joy is KonMari consultant-in-training Renelyn Tan-Castillejos. She first asked us to remove everything inside our bag. She mentioned that the best way to start the KonMari Method is in our bag. 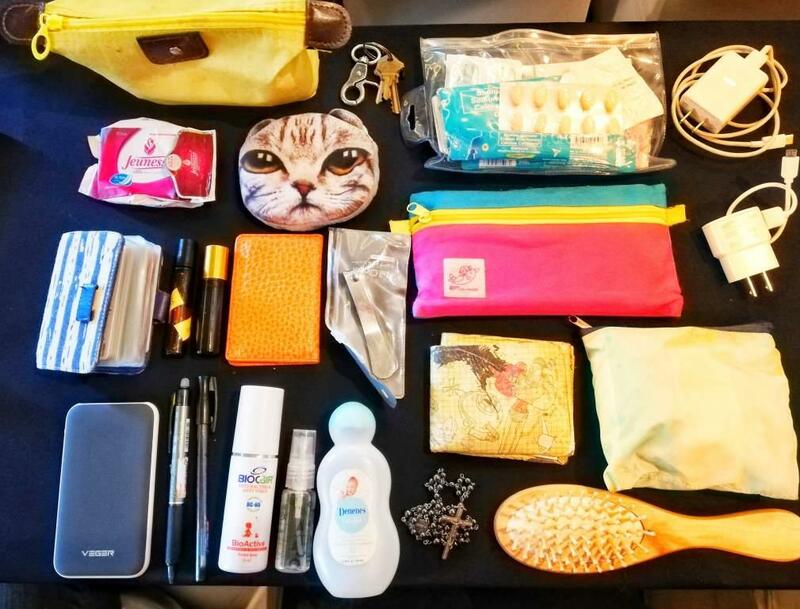 The items inside our purse reveal a whole lot about our personality – from our cleaning habits to our preparedness. So we were asked to take out everything and throw items we think we no longer need and do not spark joy. I didn’t throw anything at first. For me, the pantyliner, nail cutter, and other things (I seldom use) found in my bag measure my preparedness for unforeseen circumstances. But I later grasped the idea that what I must hold on to are things that matter. That way, I will not only be able to live life lighter but also happier. The very same effect Castillejos experienced the first time she embraced the KonMari Method. She considered it as life-changing that she wants to share it with everyone. 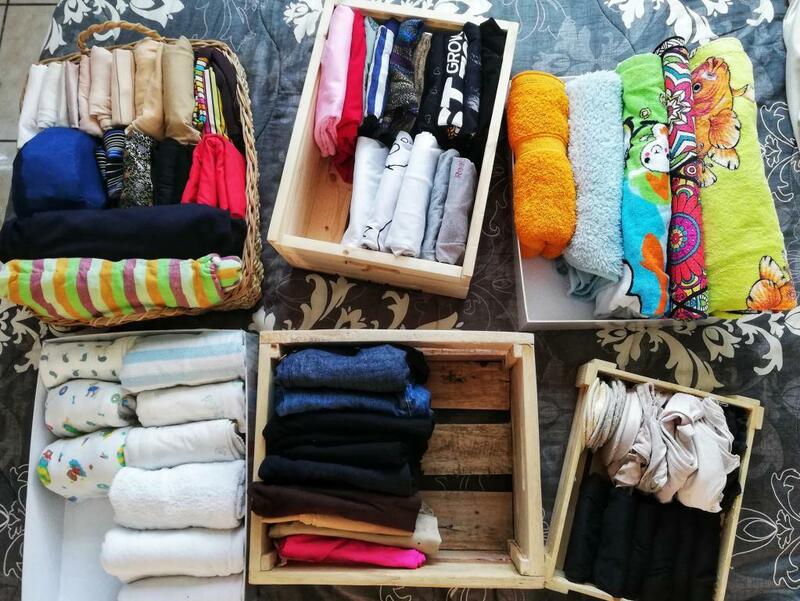 The KonMari Method made her husband and herself “more peaceful, more loving, and kinder.” She thought that “if more of us try to live with important things, then maybe, the world would become kinder and more peaceful, too. Castillejos showed through example the difference between cleaning and tidying. She likewise stressed how tidying could change lives, starting with our own. Thus, the whole what’s inside my bag activity. As Castillejos pretty much tackled some KonMari Methods, I will focus on the effects of tidying. I agree with Castillejos that the beauty of tidying goes beyond a clean home. Once we remove the clutter, we tend to see the essentials. We are filled only with the things we genuinely cherish and value, thus making us happy. And that happiness radiates within us spreads like a virus until everyone is beaming with delight. Being surrounded with everything that brings joy, you are all the more eager to embrace further challenges. This eagerness comes from your desire for greater self-discovery and fulfillment. With a joyous spirit, your aim for a vibrant home and a less dramatic relationship, until your principles and perspective are transformed positively. With an objective to be surrounded with things that spark joy, you become accustomed to the idea of happiness. Decision-making isn’t confusing anymore as you are confident to gear towards everything that brings joy. Happiness becomes your lifestyle that complicated, unruly thoughts and practices aren’t welcome. As the KonMari Method becomes your state of mind and way of life, you begin to cherish things and relationships that spark joy. You are your optimistic self, always seeing the silver lining even in the most gruesome things. Castillejos named her KonMari consultancy Yorokobi which means “joy” in Japanese. After all, the core principle of the KonMari method is to hold on to things that spark joy. And Castillejos radiates this cheerful and very calming personality in her every word spoken and action taken. Here I am in my room, first time to do the KonMari Method. This method is far from giving me the illusion of perfection. It helps me understand and see that a happy life is possible despite the absence of abundance, luxury, and glitter. Before I end this narrative, allow me to share with you a few inspiring phrases I learned from Castellejos. Konmari isn’t throwing things away; it is letting go of items that don’t serve life’s purpose. Do not wait for a slimmer you to wear that fab dress. Give it away if it’s too small. You might not lose weight anyway. But if you do, celebrate and buy new clothes. Be courageous to let things go. It doesn't mean that if there is space, you need to fill it. Don’t make a museum out of your home. Don't wait for a special occasion; use your most treasured bag or chinaware. Find your inner you; you need not copy other’s house. 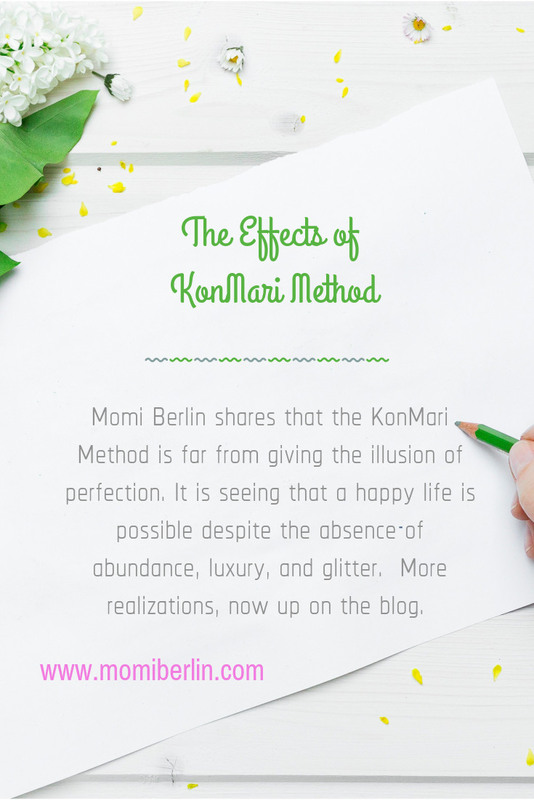 Want to start the KonMari Method? Do not buy new containers and drawers, learn to repurpose things. Do not force the KonMari Method to loved ones. Just do it for yourself. Your happiness will radiate, and others will see the glow in you. That’s the time they will be interested in trying the method as well. The KonMari Method is not mere cleaning your house, but changing your habit. Thank you for sharing this Momi Berlin. Kahit di kami nakapunta sa workshop, you aleady gave us insights about this Konmari Method. I will apply this too. I’m a minimalist by nature, but having sons and keeping the house tidy don’t match, haha! I do try to keep it tidy around here and have applied konmari on our clothes. i just find it very challenging to maintain. Maganda pla ang effect ng Konmari method. Naaaply mo talaga sya sa everyday routine bilang nanay. I apply this para maaus ko din ang mga gamit na hindi Naman na kailangan.